Mayans worshipped a large number of gods and goddesses. Since the Mayans relied heavily on agriculture, gods pertaining to natural phenomenon affecting agriculture were considered very important. Mayans also believed that the coming and going of seasons and major annual occasions were also the doing of the gods, so they had many gods related to their cosmic view. Mayans offered human sacrifices quite often and they believed that their sacrifices supplanted the strength of the gods. Mayans believed in a complex underworld called Xibalba and had many gods associated with it. Mayans had a number of beliefs regarding the nature and shape of the Earth. In some Mayan traditions, earth was depicted as of square shape with four directions. The analogy of a maize field was used to represent this view of the Earth. Another popular view in Mayan mythologies was that of Earth being circular which Mayans believed to be the back of a turtle floating on waters. Mayans also divided the cosmos along different realms, with Earth being the place which the gods created and populated with human beings. Mayans had extensive mythologies which informed their views on subjects such as cosmology, creation of mankind, beginning of the Earth and the natural phenomenon. Mayans believed that the mankind on Earth was created a number of times. The earliest version was created from mud by the gods. These humans didn’t have a mind of their own, so the gods were displeased with them and destroyed them in a deluge. The second kind of humans were created from wood but they were immortal and didn’t honour the gods, so the gods destroyed them as well in hot water. The third kind of human beings were created from maize and they turned out to be very wise. Initially, the gods wanted to destroy them for being too intelligent but one of the gods dimmed the intelligence of these humans and then they were spared by the gods. Mayans believed that if they lived a life which pleased the gods and died a death which was agreeable to the deities, they were given a piece of the heaven after death. They also believed that gods lived in the heavens and that the ancestors which passed away also took up their position in the skies. Based on this, Mayans firmly believed that their ancestors looked on their fates from the sky and were well informed about them. The Mayan underworld was a place which was synonymous to the notion of hell in other religions. Mayans believed that those who didn’t worship properly or didn’t sufficiently please the gods went to the underworld after their death. They further believed that the underworld was inhabited by many demons who would be released and come to destroy the world if the Mayans didn’t worship properly. This added a staunch communal aspect to the Mayan worship. Masks were worn at religious ceremonies by priests in a bid to scare the demons and keep them from escaping the underworld. Interestingly, mirrors were considered a medium through which the spirits from the underworld could escape. This is why Mayans generally didn’t look into mirrors and had many superstitions about them. 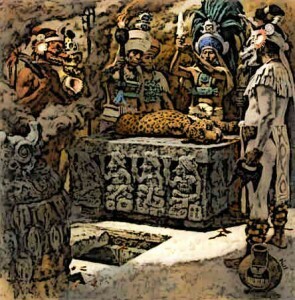 Mayans had a number of myths associated with the underworld. According to them, the ballgame began with the saga of the Hero Twins who undertook a number of adventures in the underworld. Mayans believed that Hero Twins had played a number ballgames against the underworld lords and at the end of these games, they defeated the lords. They held that it was after this saga that ballgame was invented. And professing their firm belief in this myth, Mayans staunchly associated their actual ballgames with notions of underworld and symbolism related to life and death. Symbols of underworld were usually drawn on the floor of the Mayan ballcourts. Mayans generally offered animal sacrifices to the gods in a bid to please them. The harder it was to hunt an animal, the more treasured was considered its sacrifice. Goats were among the more commonly sacrificed animals while jaguar sacrifices were the rarest and considered exceptionally valuable. In times of distress, Mayans believed that human sacrifices would please the gods and alleviate the danger, so they offered human sacrifices in larger numbers. The victims were typically slaves who were killed in ritual sacrifices and offered to the gods as a tribute. Mayans believed that world had been created a number of times before but was destroyed each time. According to them, the last such destruction took place as a result of a huge deluge and the collapse of the sky. The flood drowned everything on Earth. Later, the gods raised the sky once again and then erected five World trees. After this, mankind was created in its present form. Mayans believed in a large number of gods. The primary deities varied from one Mayan city to another. Among the most important Mayan deities in many cities was Chac, who was believed to bring down rain and thunder. Kinich Ahau was the Mayan sun god who was believed to move the sun in the sky and help the seasons turn. Maize god Yumil Kaxob was also an important Mayan deity and Mayans believed that he was among the ancient deities who discovered the plant of maize and gave it to the mankind. Mayans had extensive mythologies which informed their views on subjects such as cosmology, creation of mankind, beginning of the Earth and the natural phenomenon. Two key aspects of the Mayan mythologies was the paramount importance of maize-related motifs and the conception of deities for different natural phenomenon. They also believed in different levels of the universe. The heavenly world was considered occupied by gods and the deceased ancestors of the Mayans, the earthly realm was the habitation of the humans and Mayans also believed in the existence of an underworld where different demons existed. They believed that if these demons escaped the underworld, they would destroy the world of mankind. Mayans also offered animal and human sacrifices to their gods as a meant of pleasing them.